Children's Worship Bulletins include Scripture lessons from the majority of the Bible. By studying the letters written to the early churches, the life of Christ in the Gospels and the story of God's chosen people in the Old Testament, children learn the important truths for today from the relevant messages throughout the entire Bible. By using our theologically sound and biblically based bulletins, you'll find it easy to plan Sunday school activities that children are sure to love. In this short article, you'll find two examples of Sunday school activities about John. We've included activities for ages 3-6 and another for ages 7-12. Try them and see how easy it is to create meaningful Sunday school activities with Children's Worship Bulletins! Give each child a bulletin (or the optional enlarged page), crayons or colored pencils. 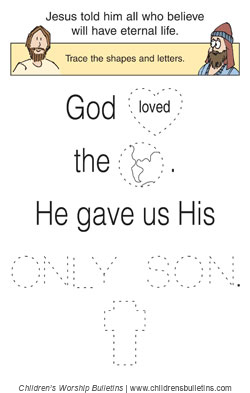 Explain the activity, "To help us remember that God loves the world so much that He gave us His only Son, we're going to make necklaces that we can wear to remind us. First, let's solve the puzzle 'Jesus told him all who believe...' Then, we'll cut out the heart, the world and the cross to make a necklace." Have the children solve and color their bulletin page. Help each child tape his or her pictures onto the yarn necklace. While the children put on their necklaces, read aloud John 3:1-17 to reinforce the lesson. life = raise arms and shout, "Wooooo!" 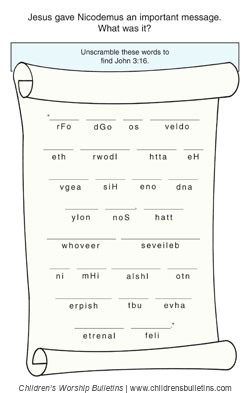 Have the children complete the puzzle by unscrambling the words below each line. "For God so loved the world that He gave His one and only Son that whoever believes in Him shall not perish but have eternal life." Explain the activity, "We're going to learn this verse using a fun game. We'll substitute sounds and motions for some of the words in the verse." Review the sounds and motions on the board so that everyone knows how to do them. Explain further, "First, we'll say the verse without the substitutions. Then, we'll add one substitution when we say the verse. Then, we'll add another substitution. After we've added all the substitutions, we'll say the verse again without the substitutions." Start by saying the verse without the substitutions. Next, say the verse, but substitute three claps for "God" (i.e., "For 'clap-clap-clap' so loved the world ..."). Continue with the next sentence, adding the first two substitutions (i.e., "For 'clap-clap-clap' so loved the 'snap-snap' that He gave His one and only ..."). Continue making substitutions until all of the motions and sounds have been added (i.e., "For 'clap-clap-clap' so loved the 'snap-snap' that He gave His one and only 'shhhhhh' that whoever 'buzzzzzzzz' in Him shall not 'stomp-stomp-stomp' but have eternal [raise arms] 'Wooooo!'"). Finally, say the verse again without the sounds and motions. Once you've had the chance to see how easy it is to plan meaningful, fun and engaging Sunday school activities about John, consider subscribing to Children's Worship Bulletins. Each week, we'll email links to bulletins from our extensive library. Choose a lesson from the Old Testament, the Gospels or the Epistles. Download the bulletin that's right for your class, and reproduce as many as you need.